If you ask me, Galentine’s Day is better than Valentine’s Day. Being a now 30-something, I cherish time with my girlfriends. A few years ago, I hosted Girls Night In. Since then, an annual Galentine’s Day Brunch has become my jam. Throwing a soiree is easy once you know the formula. Do you have China? Girlfriend, then it’s time to bust it out! If anyone appreciates the work that goes into a beautiful table, it’s your girlfriends – especially for Galentine’s Day! I love a fancy brunch and nothing says fancy like China. For the plates, I love the Lenox Golden Waterfall plates. They’re perfect for nearly any event as are the Kate Spade Larabee Dot Champagne glasses for mimosas and stemless wine glasses for water. I like to think about table design as though it’s an outfit. The plate and utensils are the basic clothes. Every other component (glasses, napkins, place card, menu) is an accessory. Each of the accessories really make the table come to life. Ideally, you want three or four ‘accessories’ per table design. First things first, set a classy table with a paper menu. I have a super simple menu template you can use on Girl Meets Party. Then comes the meal. Check with guests to see if anyone has any allergies or food aversions. If anyone has a dietary restriction, plan the meal so they can eat at least half of what you make. In terms of setting the menu, I always recommend one meat main, one vegetarian main, one or two vegetables and something sweet. For a brunch, I’d recommend a french toast casserole, an egg casserole with meat, breakfast potatoes or hash browns and some fruit. Sure, the conversation will be flowing, but you can’t go wrong with a simple game. Using paper from Paper Source embossing powder and the embossing heat tool, I created simple question cards. They looked fancy, but honestly they were just printed off my home computer. Make a list of 10-20 questions that apply to your friends to get the conversation going! I always love to give a small favor to guests to say thanks for coming. If you’ve seen my parties, you know I love mini champagne labels. They’re perfect as table decor and double as a favor. 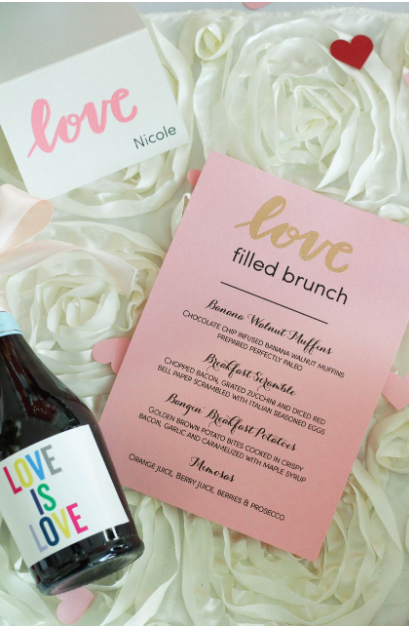 I couldn’t have been more thrilled to design our ‘Love is Love’ mini champagne labels from Gardenia Labels – one of my favorite etsy designers. 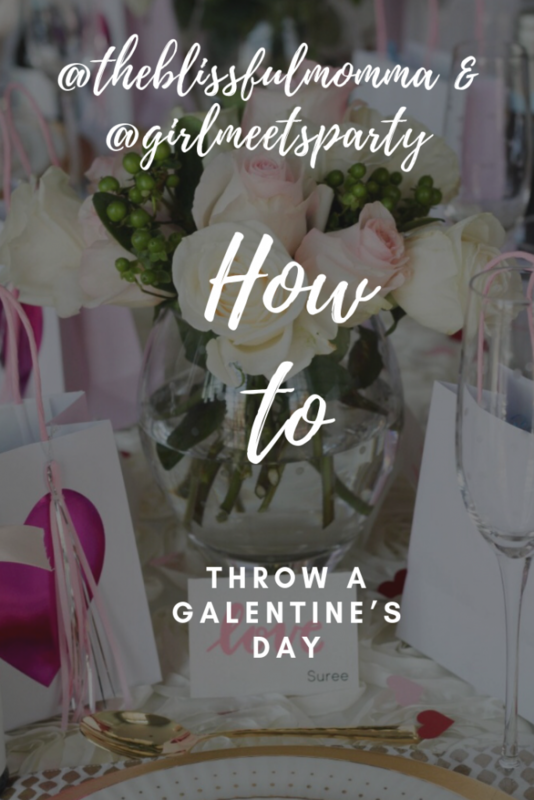 So tell me, have you had a Galentine’s Day Event before? Will you have one this year? And don’t forget to visit Girl Meets Party for more party planning tips. I wish I could put together something like this but all my friends live in different states. What a great idea! This is such a cute theme!! <3 I love the tiny details and especially the food! Thank you for the inspiration. I have never heard of the term Galantine’s Day but I absolutely LOVE the concept! What an elegant brunch. From the table setting to the paper menu to the cute mini champagne bottle favors! I bet it was a delightful time!